Burlington Motors is a family run independent garage who have been established since 1956…formerly of residence within Burlington Mews in Acton for 32 years we now reside just a few hundred meters up the road (beside Acton Central train station, Station Yard) and have now been here for over 30 years. Handed down through three generations of the same family, we have dealt with and retained many of our customers over the years and are proud to be dealing with second and third generations of those same families. 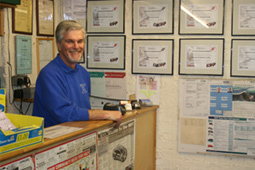 Our highly skilled and loyal team here at Burlington boast over 120 years accumulative experience! As well as this we are constantly staying ‘up-to-speed’ with new training to ensure that we continue moving forward with the times. For you the benefits are simple – we really can offer the best possible service for you and your vehicle in West London.